This review was originally posted on January 12th, 2011 by Lois Holzman, Director of the East Side Institute here. I don’t think very often or very concretely about prison life. I imagine most people don’t. We know the horrific statistics, but not the people. Unless we ourselves or friends, colleagues or relatives work in or have served a prison sentence, our forays “inside” come through film and TV. Since I’ve read Jonathan’s book, its imprisoned men and women and the theatre artist-activists who work with them have become part of my life. I think about them, remember their stories, the roles they played on mostly make shift stages, and the ways they spoke of the impact. Jonathan’s book includes chapters on sixteen different prison theatre projects in the US, and each one is a good read. There’s honesty in this book and no polemic. I recommend it! 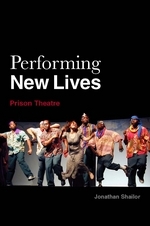 To learn more about prison theatre programs, check out the PrisonTheatre Consortium blog.